Excellent workmanship, each is carefully hand-made by experienced dressmakers. S--------Bust 37.4"----Shoulder 15.3"-----Waist 33.5"-----Sleeve 24.1"-----Length 46.4"
L--------Bust 41.3"----Shoulder 16.1"-----Waist 37.4"-----Sleeve 24.8"-----Length 48.1"
XL-------Bust 43.3"----Shoulder 16.5"-----Waist 39.4"-----Sleeve 25.2"-----Length 48.8"
XXL------Bust 45.8"----Shoulder 17.1"-----Waist 41.9"-----Sleeve 25.6"-----Length 49.6"
XXXL-----Bust 48.4"----Shoulder 17.7"-----Waist 44.5"-----Sleeve 26.1"-----Length 50.4"
Long pointed split tail to the rear, plus with decorative strap at the back. 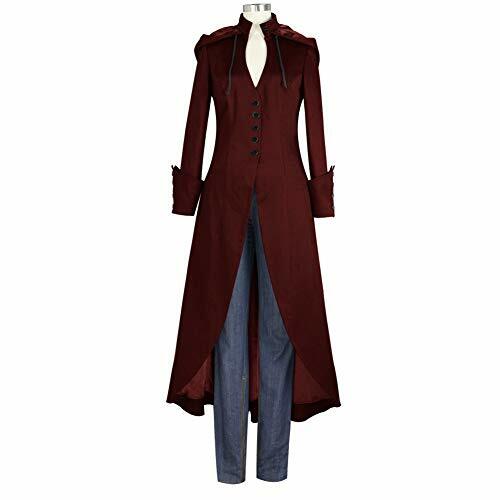 Feature:Victorian Coat/Trench /button up/Long sleeve/stand collar/slim fit. It's a great addition to your wardrobe for a Theater Production or Period Reenactment Event! Due to the differ color between different monitors and screen,the picture may not reflect the actual color. If you have any questions about this product by ED express, contact us by completing and submitting the form below. If you are looking for a specif part number, please include it with your message.